When my girls were small, Hannah instituted Family Game Night, held once a week on Thursdays. My husband would pick up a pizza on the way home, I would make a salad and the girls picked the games. Since we homeschooled, we avoided the hectic after school schedule. Our family time was sacred and memories of those days remain sweet. Today, however, with two girls in college, holding part-time jobs and my husband and I working, eating together has become a challenge in a different way. A couple of years ago, we instituted Family Dinner Night, in an effort to spend more time face to face with our kids. One of our favorite thing to do is to meet at Carraba's Italian Grill. The atmosphere and food reminds us of home cooking, Italian style, but gives mama a night off. 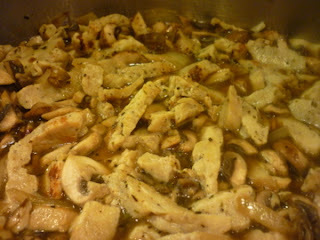 A favorite dish is their Chicken Marsala. 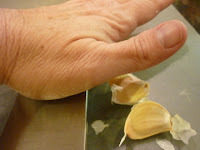 Using your chef's knife, remove the garlic skin by placing the knife on top of a clove and pressing down with the heel of your hand. Repeat with remaining two cloves. 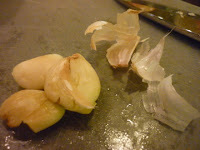 Next, mince the three cloves of garlic and set aside. Dice a medium onion and slice up some mushrooms. I use around a pound because I love them... alot. Heat a tablespoon of olive oil in a large saute pan. 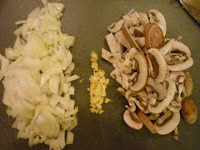 Add the onion and let it soften up a bit before adding garlic. 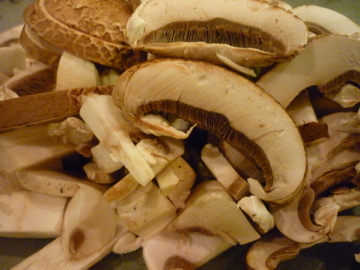 When garlic is nice and golden, toss in mushrooms. Frequently stir everything around to keep it from browning too much in one spot. 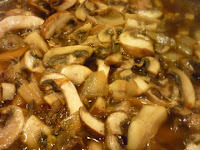 Splash in a half cup of Marsala wine and scrape the bits of vegetables off the bottom of your pan. I like to use a wooden utensil instead of metal for this. The sound of metal on metal reminds me of nails on a chalkboard for some reason. 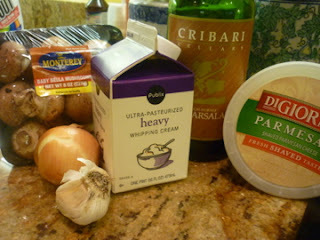 Next, add a cup of chicken stock, preferably homemade. Let the mixture simmer for a few minutes. Look at the veggie mixture simmering on the stove... doesn't it look inviting? I could dive right in. 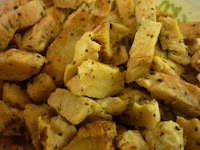 Now, add two or three cups of pre-cooked, grilled chicken. Sprinkle in a little Italian seasoning. Let it warm through and absorb all of the lovely flavors. You can ignore it for a few minutes while you prepare the rest of your dinner. If serving over pasta, get those noodles into the pot. 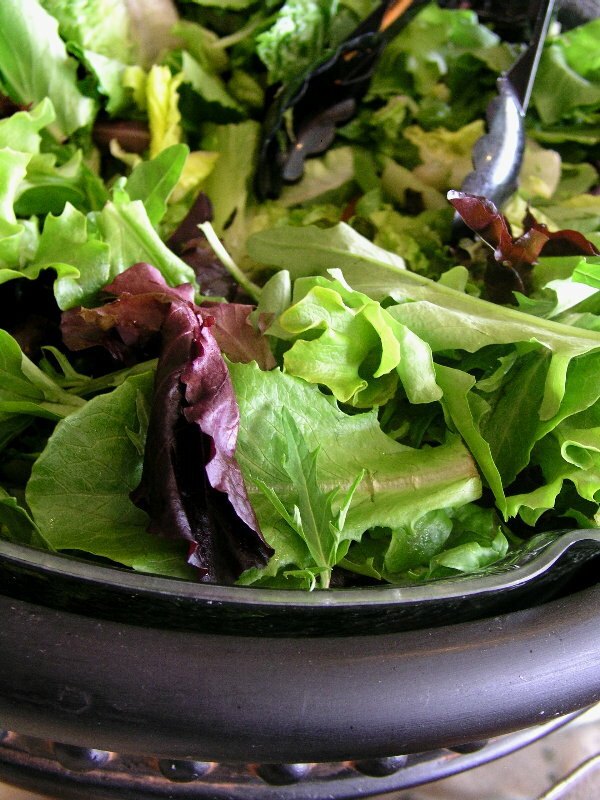 Make sure you have something green on the table. We want to keep the Food Maven happy, don't we? A pretty green salad is fast and easy. 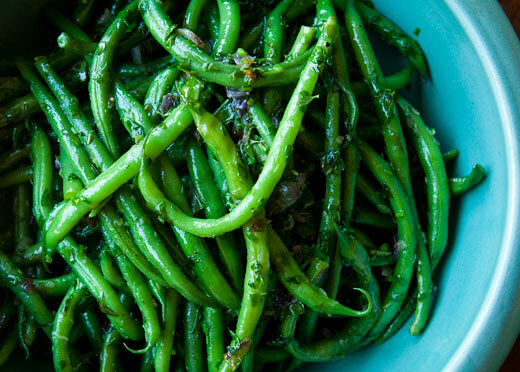 Steamed asparagus or garlic green beans would also be great. The last thing you will do is add a couple of tablespoons of heavy cream to the pan. Let it simmer for about five minutes. You should notice the sauce begin to 'tighten up,' or thicken slightly. This is good. 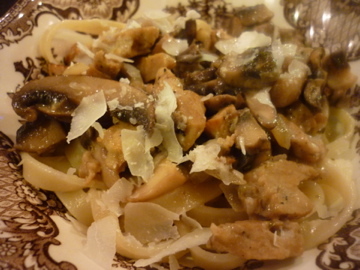 If serving with pasta, drain and throw it into the pan with the Marsala mixture. Let it absorb some of the sauce. Don't forget to taste it for seasonings. A little extra freshly ground pepper is usually warranted, but more salt may or may not be needed. Place into warmed pasta bowls and sprinkle with grated Parmesan. Mmmm. Is this making you hungry? It is making me hungry as well, so don't feel bad. It is nearing lunchtime at my house and I am throwing an Amy's Organic Margherita pizza in the oven. What? You're shocked to learn I'm not making a 'snooty' little salad for myself? Hey, I'm writing this blog to me as well as to you. Should I be the pot or the kettle today? You decide.